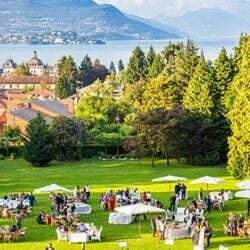 Home » Lake Maggiore Weddings » Lake Maggiore wedding venues » Stefania and Leonardo, a couple on Seventh Heaven! I’m on Seventh Heaven! – In italian Sono al Settimo Cielo! Ever ever heard about this expression? It is a quite old expression in Italian it is used in Divina Commedia by Dante Alighieri and even used by Aristoteles. In Hinduism the highest zone of Paradise was called Erawan and it was the seventh. 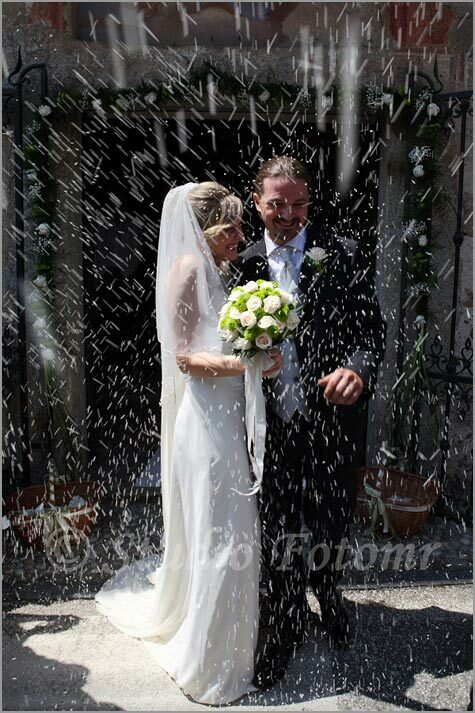 It is surely an expression on joy, simply perfect for bride and groom we want to speak about: Stefania and Leonardo. Stefania and Leonardo were on Seventh Heaven for real! 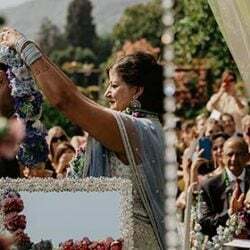 On 2nd July 2011 they had the most beautiful day in their lives and they pick Restaurant Settimo Cielo (Seventh Heaven Restaurant) in Stresa to celebrate their wedding. An unforgettable view on Lake Maggiore, wonderful Italian cuisine… could you think about anything better? Stefania and Leonardo come from Veruno a little village on Arona hills leading to Novara plain. It is a wonderful green area close to Abbazia di Santo Spirito we told you about in some of our older posts. 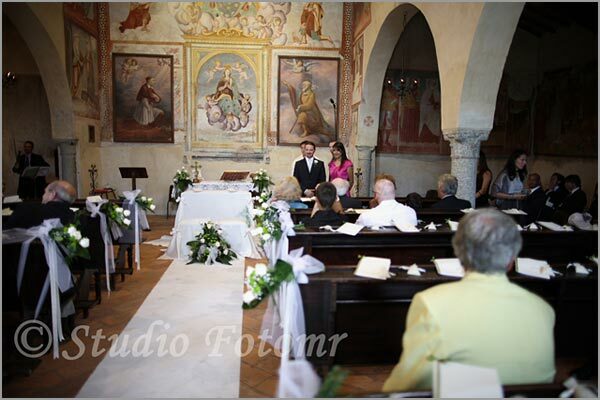 Stefania and Leonardo decided to get married in their hometown, in the little church in the centre of the village. Church is dedicated to Maria Assunta. Church indoors is amazing, just kept as it was in 1400. There are wonderful frescos on the walls giving the church an archaic aspect that you can hardly find in other churches because of the many changes along the centuries. 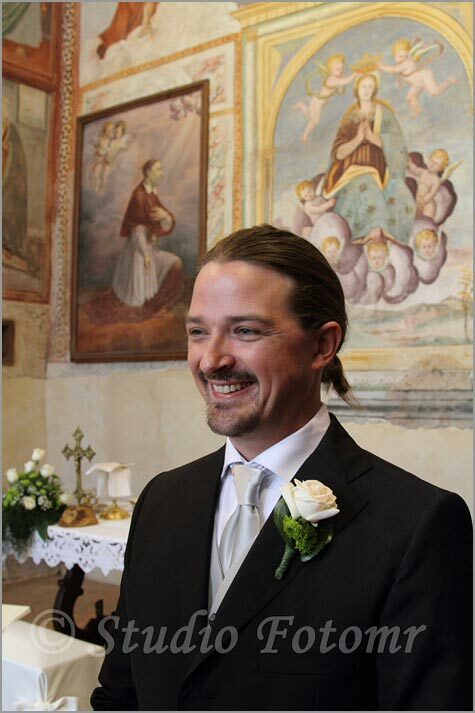 As floral designer Leonardo and Stefania asked me to create their floral decorations for the church and Settimo Cielo Restaurant. 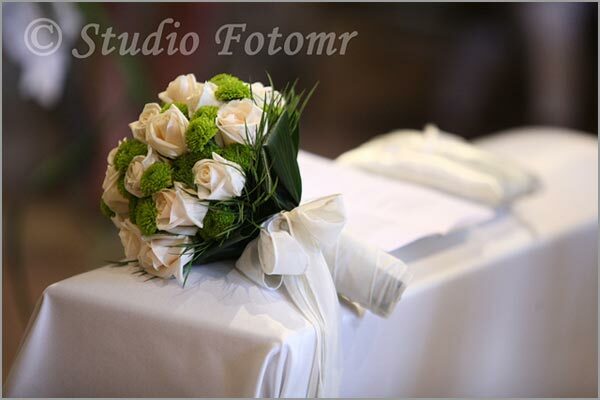 For the bridal bouquet and church decorations we opted for white and green colors using cream Vendela roses, Steel Grass and little Chrysanthemum Yoko Ono, new little botton-style chrystanthemum. You can find in this page Crisantemi verdi, perché no? all decorations I created for Stefania and Leonardo. 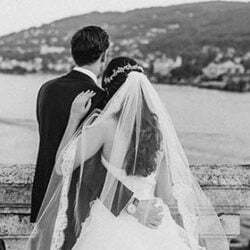 After the ceremony and rice throwing out of the church bride and groom drove to Ristorante Settimo Cielo on the hills above Stresa. The arrival to the restaurant was amazing. Sky was clear, there was a little breeze and view on Lake Maggiore was breathtaking! 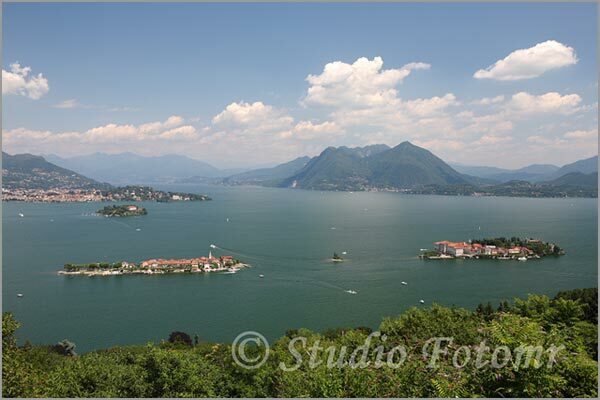 We could see Borromeo Island, Pallanza, Laveno and all Alps crown down to Switzerland, what a sight! Among many menus restaurant Settimo Cielo suggested, Stefania and Leonardo chose Menu Presidenziale. It is a rich selection of traditional courses matching Italian savors perfectly. At the end of the dinner Chef Pino Greco offer to the bride and groom a blessed bread. Stefania and Leonard broke it in two parts and then cleaning their hands with a perfumed towel as a sign of soul purification. 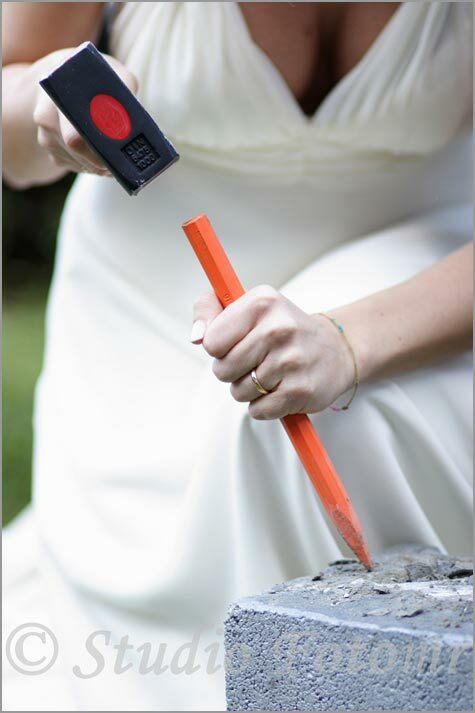 Party went on with a funny joke planned by bride and groom’s friends – a cement cube to chisel to find bride and groom pictures as fiancees. 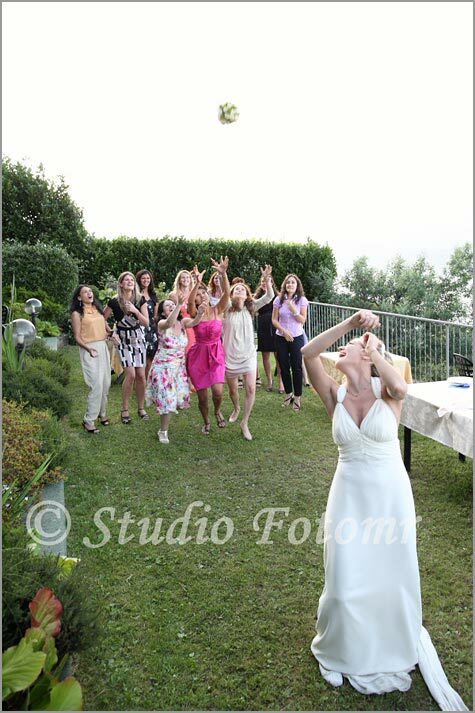 Classical bouquet throwing and cut of the heart shaped cakes…. again with a stunning lake view! 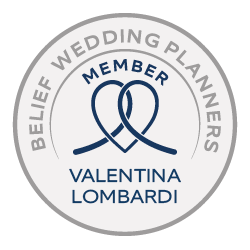 An joyful and unforgettable day for our bride and groom, Stefania and Leonardo were really on Seventh Heaven! 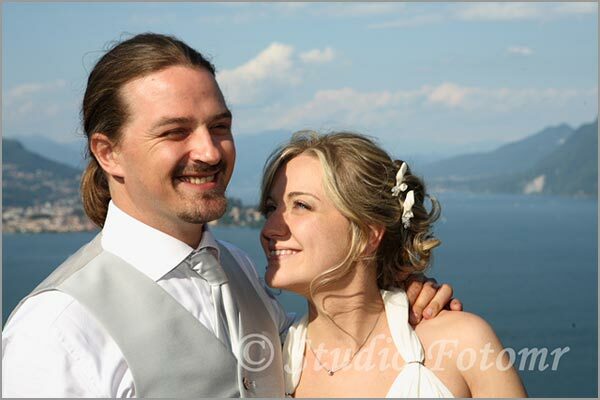 ← Just Married: Kristine and Jens, another Norwegian couple on Lake Orta!